Note: This is much more personal than I would normally be. I may take it down in future since it doesn’t show off the ‘professional me’ that I need to show to the world to be successful. But this isn’t LinkedIn, it’s my blog, so here it is. When you complete your doctorate you think everything will change and that you have the key to success for the rest of your life. I submitted my thesis in December 2011 and passed my viva without corrections in March 2012. The dates are important, as I will describe a little later. What I did not fully realise on that glorious day when the work was done and was judged of sufficient quality to award my degree, was that it was only the beginning. From then on, I was an Early Career Researcher (ECR). The primary focus of an ECR is to get funding to do the thing you love so you can continue doing work you that started in your doctorate. After all, you have just spent the last three or more years of your life developing your ideas, learning how to express them, and perfecting your research methodologies. Why wouldn’t you want to carry on with that? Alongside that, you must decide how to maximise your thesis. Should it be published in a series of articles in the best-regarded journals you can get into or is it best done as a monograph? Either way, will your PhD work be REFable in whatever form you share it? And either way, you’ll need to do a lot more writing. A thesis is not the same thing as a book. I went for a monograph. This meant that, in addition to holding down multiple jobs (the landlord and the supermarkets do not care about your intellectual achievements), I needed to find a publisher for my thesis. My viva report clearly stated that my work was worthy of publication so it would be easy: any academic publisher I chose would be surely delighted to publish my text that made such a strong and important contribution to knowledge. Except that publishers were not keen. Too niche. Not marketable. After four rejections from publishers (one of whom I do freelance work for), my mentor suggested trying to get taken on as part of a series. That worked. Fifth time lucky! Writing funding applications and composing approaches to publishers takes a lot of time and mental energy. In addition to pitching my book and trying to develop a publications profile, I unsuccessfully tried for postdoctoral funding from every funder for which I could meet the criteria of their scheme. I am grateful for the support I got from my school. I had feedback and encouragement from supportive colleagues but got nowhere. Time ticks on. Remember those dates above? They determine if you are ‘early career’ or not. All too soon I was not. The life span of an ECR is three years (up to five for some funders) unless you have a valid reason for having a career break. These were the busy, heady days of the last REF. I got involved. I needed the work. I had a sweet deal: part-time postdoctoral researcher and part-time administrator. A hybrid. I could work on my monograph while learning the transferable skills of REF administration. Of course, as you will have guessed, the admin time ate into the postdoc time. The REF has many deadlines, many peer reviews to process, impact case studies and environment reports to find evidence for, and publications to source and upload. The REF deadlines don’t care if it’s a postdoc day. I failed to make the boundaries between the roles distinct. The admin took over and my academic role subsided. I was asked if I wanted to be included as an academic in the REF. I declined. As part of my job, I had to read all of the harsh peer reviews of even some my most senior and respected colleagues. I knew that my work would not pass muster against the REF criteria. My mother died on Christmas Eve 2015. I found out on Christmas Day. Despite her being ill with cancer for quite some time, the end was surprising and swift. I was celebrating having a chapter published when I got a text from my sister in mid-December saying that my mother had suddenly taken a turn for the worse and was in hospital. The doctors said ‘six months’. I breathed a sigh of relief: I would be able to get there in time. Days later she was in a hospice. No one was sure what was wrong and why it was happening so fast. It turned out she had a lesion on her brain in addition to the breast cancer she was being treated for. 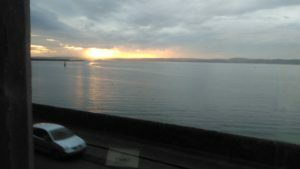 I did not go to the funeral on 3 January 2016 as I could not afford the holiday rate air fare to travel from Edinburgh to the States or even find flights that would get me there in time. I went back to work as usual in January along with everyone else, reluctant to share such miserable news with anyone who asked how my holidays had been. I finished my book. I took on board editorial suggestions, did the recommended extra reading needed to bring it up to date, and revised the text accordingly. I copy edited it myself, did the formatting myself, proofed it myself – all while performing two job roles which brought me up to full-time and freelancing. If you take anything from this post, let it be DO NOT DO YOUR OWN EDITING! I did this work against a background of job uncertainly, freelancing (ironically as an editor of other people’s work), and my mother’s death. I worked quickly and the book came out in April 2016 instead of the originally planned June 2016. This review of the book shows why doing my own editing was a bad idea. You don’t get to do it over once it is printed. My unsuccessful second attempt at a British Academy postdoc was the end for me at my by then purely administrative job. The postdoc stuff was all in my own time by then. I could move a lower-graded post doing much the same role or I could be redundant. I did not want an administrative role. I wanted to do research and to run my own project. I did not want to go on day-long training sessions about developing impact case studies or managing change. I could not, and did not, pretend that I did. This has been a tale of woe, misery, and disappointment. There was too much going on for me to enjoy my academic successes in getting things published or to take stock on what I was doing and why. I haven’t really shared a lot of this before but I believe that the personal stresses I had at the time made it difficult to respond to the challenges to my job. Had I been more mentally fit, I might have been able to make a case for why the work I was doing was necessary and worth its rate of pay. My leaving-do was in a pub garden on a summer’s evening. As they should be. I spent a few months doing freelance work and applying for jobs. I decided to take up a new craft. 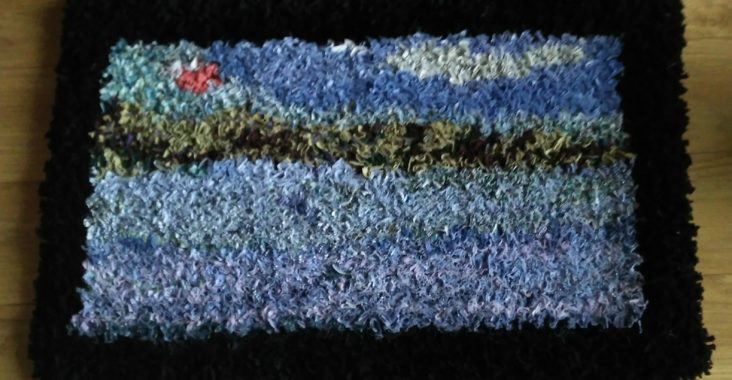 I had wanted a rag rug ever since seeing them in the Ryedale Folk Museum in Hutton-le-Hole many years ago. I bought a starter’s kit from Ragged Life and I was away. In October 2016, I found a new project-based post and it was brilliant although it only lasted a year. I also did some teaching my old department. 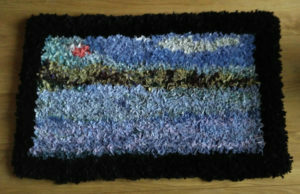 But full-time work with a four-hour-each-day commute and various freelance jobs meant that progress on my rug was slow. My one-year contract ended just before the Christmas holiday break and this year I have been training myself for a new career as a writer of historical fiction, some of it based on my PhD research. I’m fortunate: I have a partner in full-time work and just taken on a part-time new six month contract. This makes my dream of becoming a novelist realistic. The other reason I’m telling you all of this is that there has been a lot on Twitter lately about the next REF. As a ‘hybrid’ during the last one, the depressing thing I really noticed was the increase in the divisions between administrators and academics. Distrust, resentment, and even anger were present in what was (and is) normally a very collegiate and friendly school. The pressures the REF places on everyone – not just academics – can be pernicious. It instills competition where there should be cooperation. The #boycottREF hashtag has many more harrowing tales than mine. Also, if you are an ECR, it’s not the end of the world if you don’t get funding. You are resourceful and resilient – the PhD gave you that – you’ll find something else. If you are lucky you will get to use your research and skills in new or unexpected ways. I know that I have been fortunate and have been privileged to have the experiences that I have had. I might not have made the best of them, but I’m grateful for them. Your talent and resiliency are so strong I know you will land on your feet. Best regards from the USA.